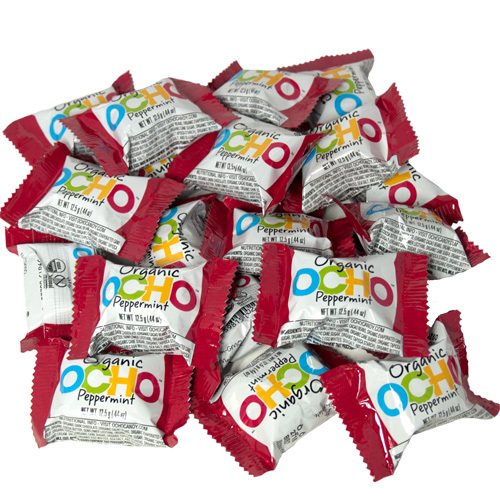 This new bite-size organic candy bar from OCHO hits the spot with a classic flavor combination—delicious dark chocolate with a fluffy white peppermint center. Refreshing! Ingredients: Organic dark chocolate (organic cacao beans, organic evaporated cane sugar, organic cocoa butter,sunflower lecithin), organic cane sugar, organic tapioca syrup, organic sugar (organic cane sugar, organic tapioca starch), organic butter (organic cream, salt), organic egg whites, sea salt, and organic peppermint oil.